Most people dedicate a great deal of time and effort to preserving the health of their teeth. Unfortunately, even the best dental habits don’t guarantee that a smile will stay strong and healthy forever. Tooth loss is a common oral health problem. Although it is best to preserve the natural teeth when possible, tooth loss can be treated. Restorative dentistry treatments rebuild smiles that have been damaged by dental problems such as tooth loss. At Smile Solutions by Emmi Dental Associates, our team of experienced dentists offer a wide range of treatments for missing teeth, allowing our Wilmington, DE patients to find the solution that best meets their unique dental needs. A dental bridge is a restoration that is designed to fill in gaps of space left behind by a missing tooth or teeth. These restorations are most appropriate in cases in which the patient still has natural teeth on both sides of the gap left by a missing tooth or teeth. Traditionally, dental bridges are secured by dental crowns that are placed over the two teeth directly adjacent to the lost tooth. However, we also offer implant-supported bridges, which are secured by surgically implanted dental implants. In either case, the gap left by missing teeth is filled in by a single pontic piece that is fabricated to resemble the tooth (or group of teeth) that has been lost. Dental bridges enhance the appearance of the smile while restoring a patient’s full oral functions. Dentures are most commonly used to treat cases of significant tooth loss. When a large group of teeth has been lost, patients can receive a partial denture. Full dentures are a great solution for patients who have lost an entire arch of teeth, or even their complete set of teeth. Traditional dentures sit over the gums and create suction that holds the dentures in place. We offer custom dentures that fit comfortably and function without slipping out of place. For those patients looking for added security, we do offer implant-supported dentures, which are typically held in place by a set of four to six dental implants, depending on the size of the dentures. Both traditional and implant-supported dentures restore oral functions following substantial tooth loss. Dental implants are the newest solution for tooth loss, but they have quickly become the standard when it comes to treating missing teeth. 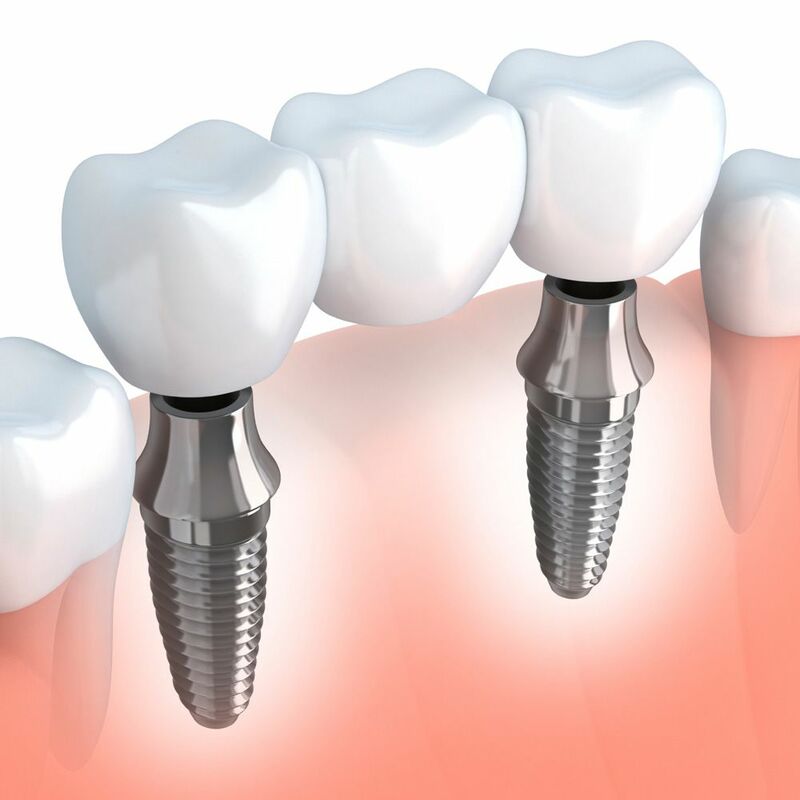 Dental implants are small titanium screws that are placed directly into a patient’s gum line. As the implants heal, they fuse with the jawbone and act as artificial tooth roots. Small metal abutments are attached to the dental implants and, together, the abutments and implants act as anchors for dental restorations. Aside from being an option for patients who are in need of dental bridges or dentures, dental implants can also secure a dental crown. Because of their versatility, dental implants are a great option, whether a patient has lost a single tooth or an entire set of teeth. Dental implants are the closest a patient can get to replicating their natural teeth and maintaining full oral strength, function, and beauty. If you have suffered from tooth loss, there are many options available for treating missing teeth and restoring the strength, function, and beauty of your smile. Restorative dentistry treatments can rebuild your smile and prevent more complications from developing. To learn more about these treatments and find out which is right for you, schedule an appointment with one of our experienced dentists at Smile Solutions by Emmi Dental Associates.